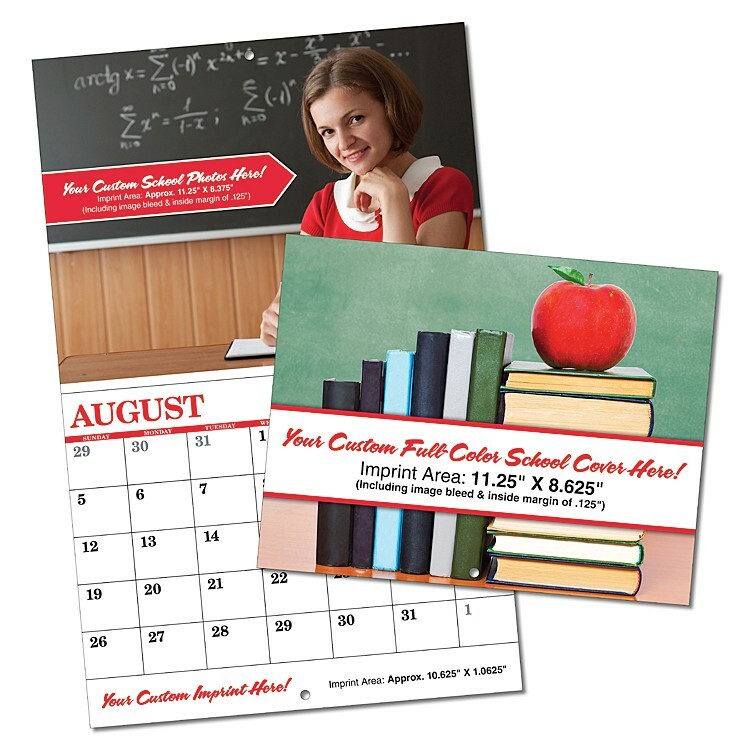 Create your own custom 13 month school calendar with a personalized full-color cover and custom personalized full-color images for each month. Personalize the bottom of each month with your custom imprint. Use it to display the school schedule such as: parent-teacher conferences, start and end of semesters, school holidays, teacher work days, school vacations, school sport schedules important dates, dances, anything and everything having to do with your school year. Use the back cover to include important school numbers. Use the bottom of each month to advertise local business, school sponsors, booster clubs, foreign exchange students, summer job opportunities, etc. Calendars are printed in full-color on 80# Gloss Text. The cover is full-color UV-coated 8 pt (C1S). These calendars are 11x17 open and 8.5x11 closed. Bound by two stitches and have 1 hole drilled for easy hanging. Price includes printing in full-color (full color process), folding, and staple binding. Exact color matches, metallic and fluorescent colors not available in full-color.